Robert Joseph (Beverly Hills) - Book Appointment Online! Minimal incision to get you better and fixed without damaging more tissue than needed. 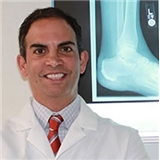 Dr Joseph is a surgical podiatrist specializing in ankle sprain repair, plantar fasciitis, neuroma repair, hammer toe and bunion correction. Dr. Joseph was very friendly and explained everything. He spoke very fast so you have to be on your toes.